I have been working on Quadra Island the past few weeks. This is a common sight along logging roads. 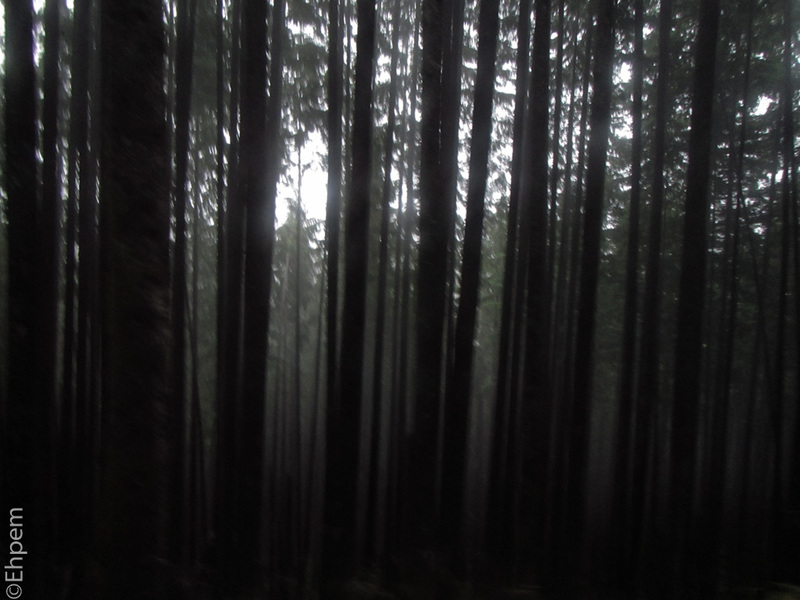 Normally one is driving past these young forests and tree trunks flicker as they blur past. This out of focus view sort of captures the effect. I did take video, and when home will work some of that up and post it too. I am driving south today, so tomorrow will be back to the home routine. Love this. I enjoy your 52 rolls posts. You really put the cameras through the paces. I will be doing some of the same….. Thanks lasousa. I have been too busy to do 52 rolls of late, though I have been shooting film and more than shot 52 rolls already, I doubt I will be able to catch up on that commitment. Our young royals are out your way as we speak, enjoying the forests yesterday I think. I love woods like this with those tall upright pillars that I always enjoy shooting. Hi Andy. They are indeed. One of the philanthropists that is funding the research I involved in was invited by a First Nation to a ceremony to receive them in the Great Bear Rainforest area. On facebook I have seen several of my higher ranking First Nation friends in their regalia at the ceremonies as witness, dancers or in conversation with them. It is an interesting intersection of nobility from different cultures.